The other day we had brilliant blue skies and fluffy white clouds. It inspired me to jump into my car, with my camera gear, and take a drive along the Kitsap and Olympic Peninsulas following the seashore. I made several stops; the first was at the boat launch at Tracyton. There were a gaggle of geese swimming about. Next, I headed to Keyport Marina, walked on the dock, and took photos of boats and this beautiful hanging basket of petunias over the seashore. Seagulls we're having a terrific time along the shoreline as the waves crashed against the tide. I also saw several ferry boats make the crossing from Coupeville on Whidbey Island to Port Townsend. 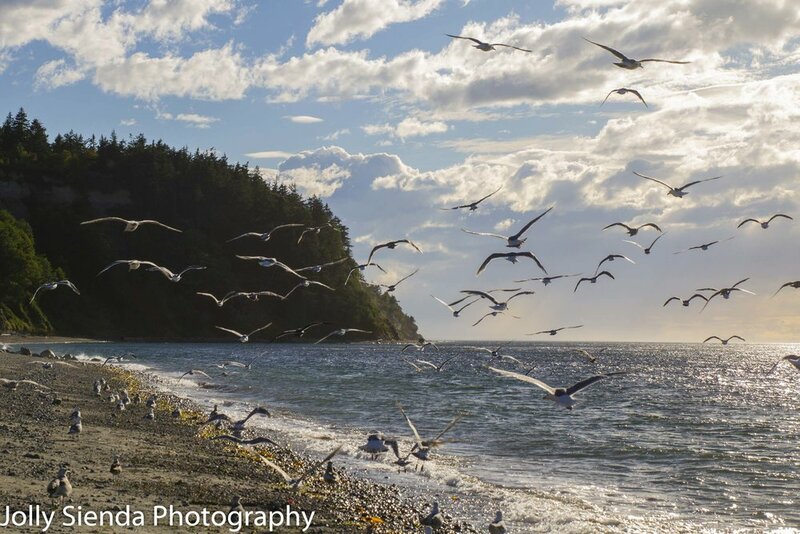 Seagulls along the shore at Fort Worden beach, Fort Worden, Washington. I love watching ferry boats, don't you?! The is a Washington State Ferry on the Coupeville, WA to Port Townsend ferry run. Geese swim along the shore at Tracyton, Washington. Before I crossed over the Hood Canal Bridge, I stopped at the Kitsap Memorial Park. There I saw a boat on the canal with an American Flag waving to me as it glided on the canal towards the Olympic Mountains. Boat with an American Flag on Hood Canal sailing towards the Olympic Mountains. When I reached Port Townsend I headed to Fort Worden to walk the beach and see the Point Wilson Light lighthouse. It was a perfect day! At dusk the pastel colors of the sky caught my attention with the curve at the beach. Point Wilson Light and a seagull were entertaining. I love the seashore, don't you? Everyone I saw there had a great time! Can you do a handstand on the beach? What's your favorite beach location? Let me know on Facebook.